The remaining components of this printer are all standard, but I am using a lot of features so configuration still requires some finesse. 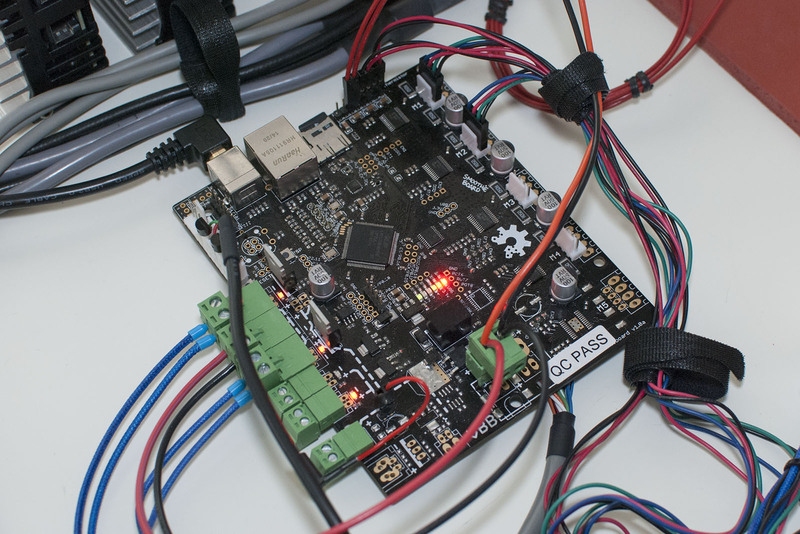 I would like to run two SSRs, however most of the easily accessible GPIO pins have already been claimed for other purposes. Smoothieboards GPIO pins also output only 3.3V which is not always enough to fully switch an SSR. 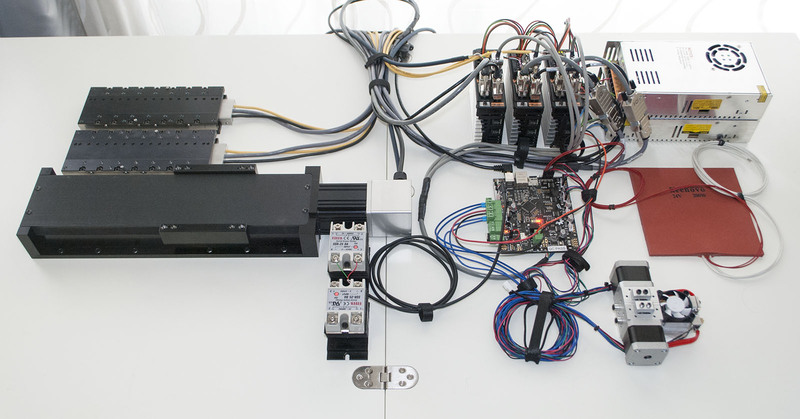 The easy solution would be to connect the SSRs to one of the MOSFETs, but this costs an output that is needed to control heaters and fans. 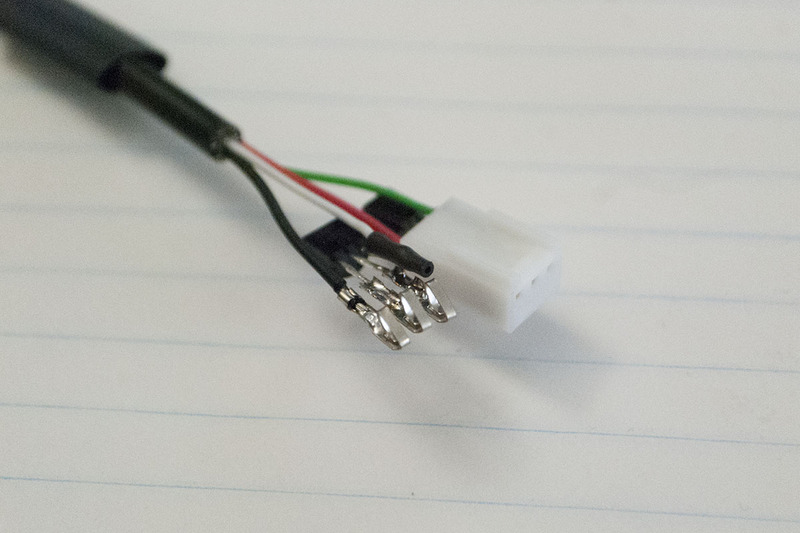 Instead I built a cable which converts Smoothies regular limit switch connectors into 5V outputs by including a 2n7000 transistor. 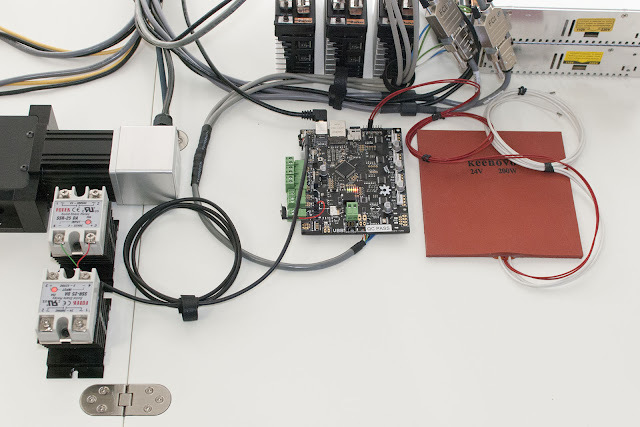 The first SSR will be used to control the 24V and 72V switching power supplies. 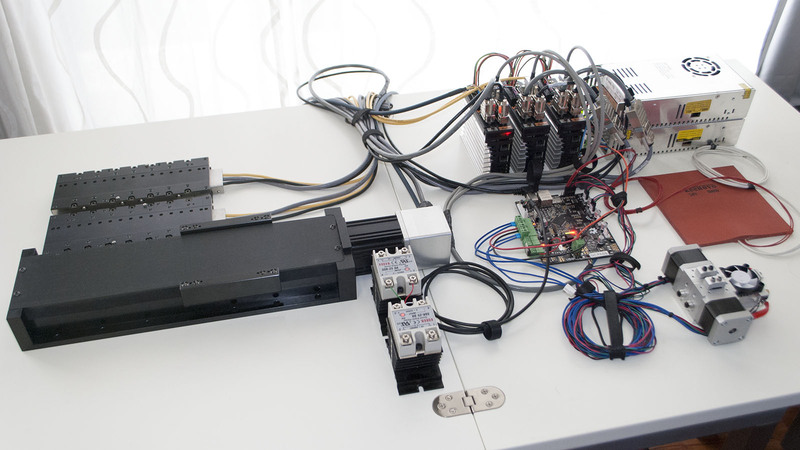 This way the printer can completely shut off even if a MOSFET fails closed. 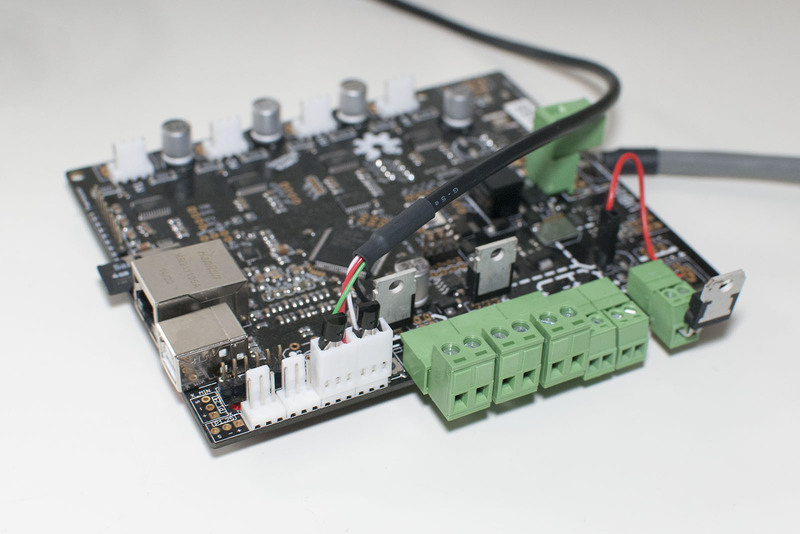 The second SSR will be controlling the heated bed. 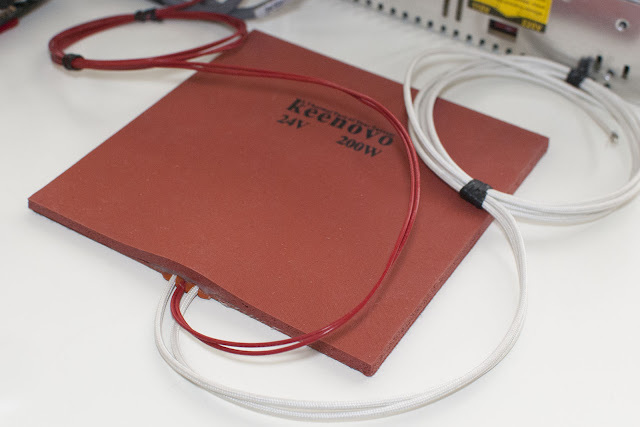 The 150x150mm 24V 200W heated bed was made by Keenovo and includes an embedded thermistor, adhesive backing, and insulation. This bed will heat up very fast as 200W is quite powerful for its size. The built in silicone foam insulation should further increase its efficiency and will also protect the servos. I have connected the temperature sensor to the Smoothieboard, but will not be powering the bed itself as it is not attached to anything and could quickly overheat. I am using Fotek SSRs for testing but they will be replaced with a more reliable brand in the final build. Finally its time to connect the dual extruder assembly. The wiring is pretty messy but the stepper motors and thermistors plug into their designated connectors, and I connected the heater cartridges to the Smoothie's large MOSFETs. We can borrow the extruder configuration from Smoothies documentation. I have only pasted the configuration for one of the two extruders here as they are analogous and quite verbose. # A dual-extruder E3D Chimera fed using direct drive Bulldog Lite extruders. The final build will include a couple of additional fans, but this completes the test assembly. I've been checking between each step so there was no moment of truth, but it is still quite satisfying to see it all move together.